Yesterday was a big day for the chicks. After having spent a month in the brooder and two weeks confined to the coop, they finally set foot on mother earth. Cyndie and I created a fenced courtyard that allows us to open the chicken door and let them test out their skills on the ground. We also installed plastic awnings over the side windows for added protection against blowing rain. The warm days that have finally arrived necessitated removal of the plastic panels over the windows, to increase cross ventilation. All the windows and the entire ceiling are covered with 1/4″ metal hardware cloth for enhanced air flow. 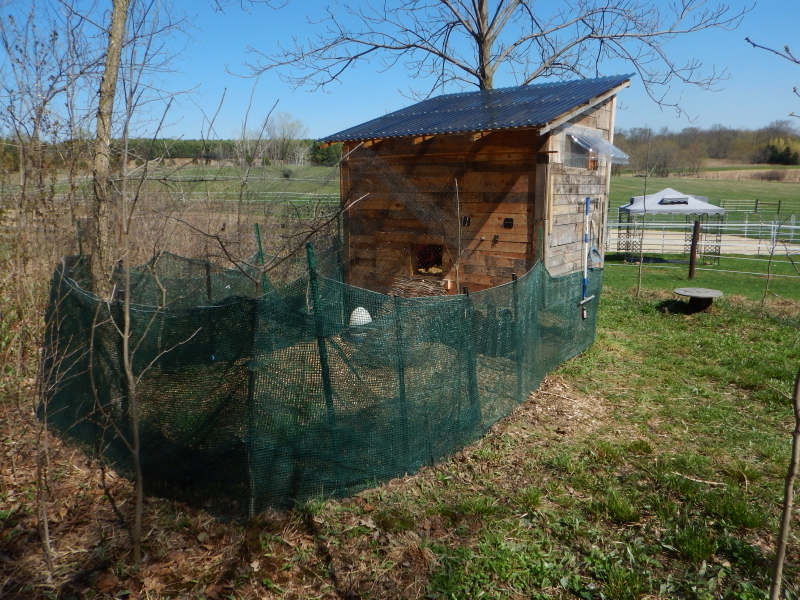 The temperature in the coop soars when the sun is shining high and hot. 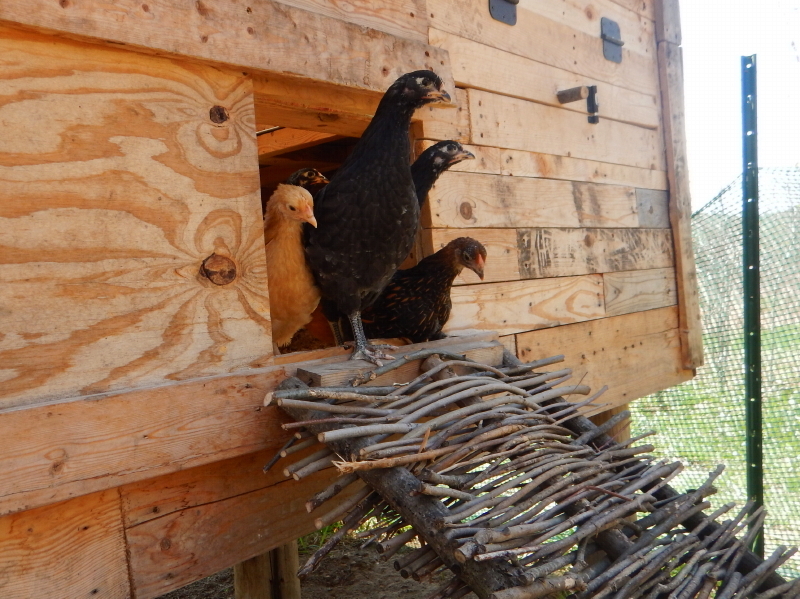 The chicks were typically tentative about venturing out. We slid open the chicken door while working our way around the fence perimeter, burying the bottom in the ground. Despite our verbal enticements to coax them out, the top of the ramp was the farthest any of them wanted to venture. There would be five or six heads peeking out, and maybe one brave bird stepping on the stoop. Then there were none. 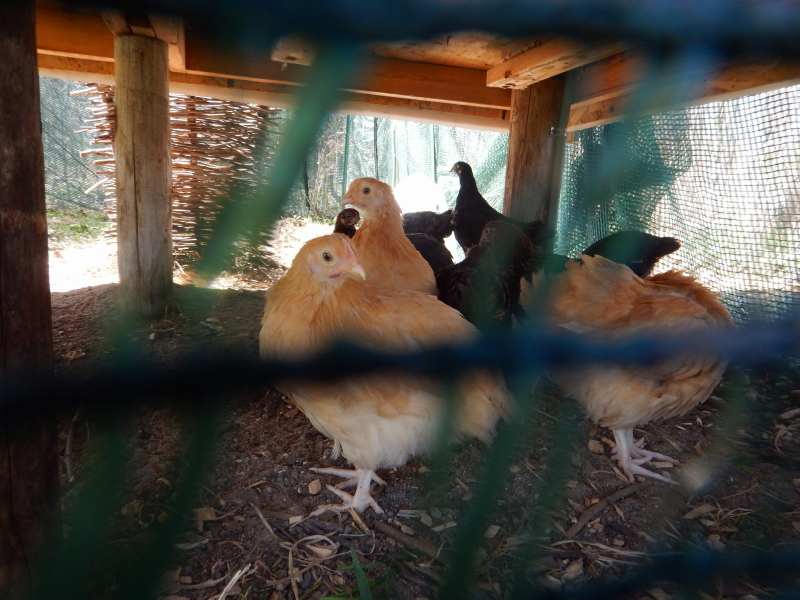 The chicks would all move back inside to the safe familiarity of their last two weeks. It was getting hot, I was getting tired and sunburned, and the hour for lunch had already passed. Without waiting to witness the chicks achieve touch down, I headed up to the house. Not long after, Cyndie arrived to join me, announcing they had all suddenly conquered the ramp and made landfall. I missed it. That’s okay. I also conveniently missed the other end of the milestone: the frenzied struggle to make them all go back inside again at dusk. That’s when you end up crawling around on hands and knees beneath the coop to snag birds and toss them back through the chicken door, trying not to let the ones already inside come back out again. Thankfully, Cyndie took the first shift. I’ll have my turn soon enough. Today is World Labyrinth Day! 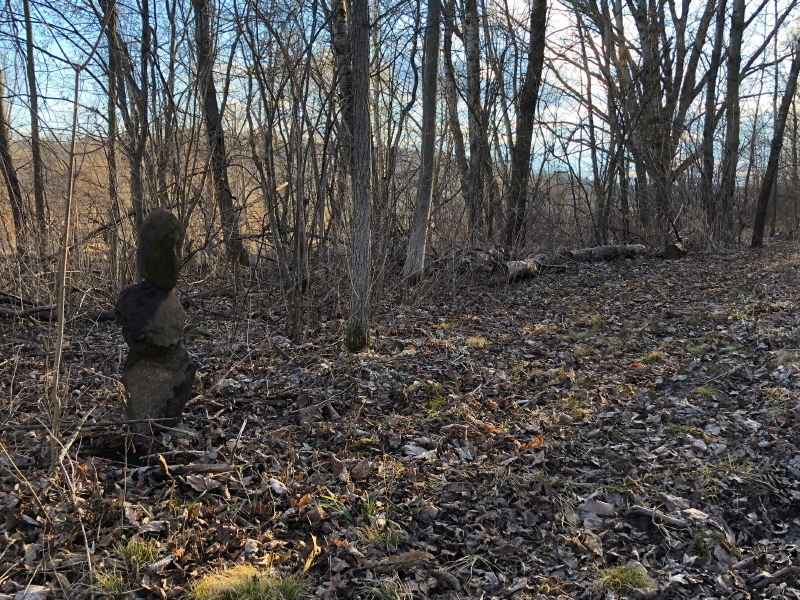 The weather is good, our land is mostly dry, the trees are budding and the grass is growing. If you are reading in the Twin Cities, it would be a great day to visit us and walk with the world for peace! The coffee will be on and the fresh horse-shaped cookies are delicious. I’ve tested one or two. Cyndie says she made them with less sugar than the recipe specifies. Since moving to the country and discovering some of the local treasures around us, Cyndie has purchased pure maple syrup only once a year. It’s that time again! 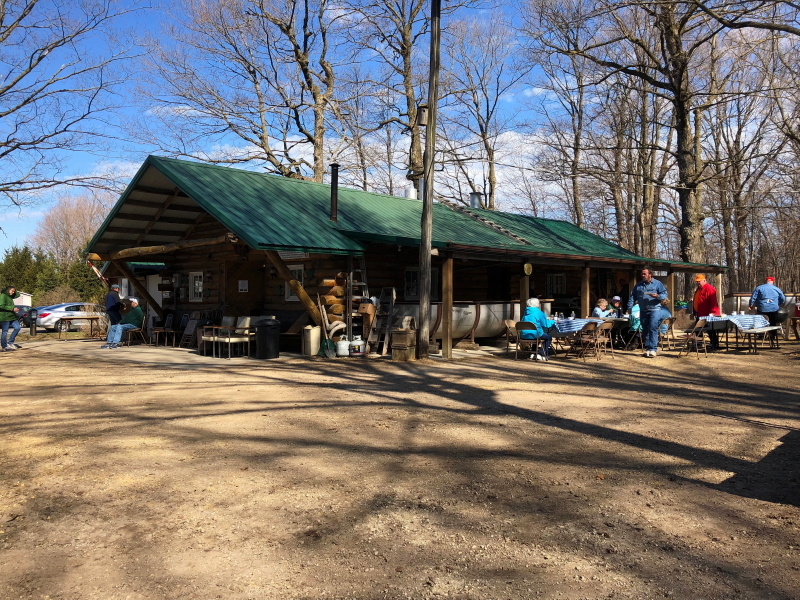 Just a few miles south of Ellsworth, the Stockwell family taps 35 acres of maple trees and collects enough gallons of sap to supply folks with a full year’s worth of syrup, if you have containers to hold it. 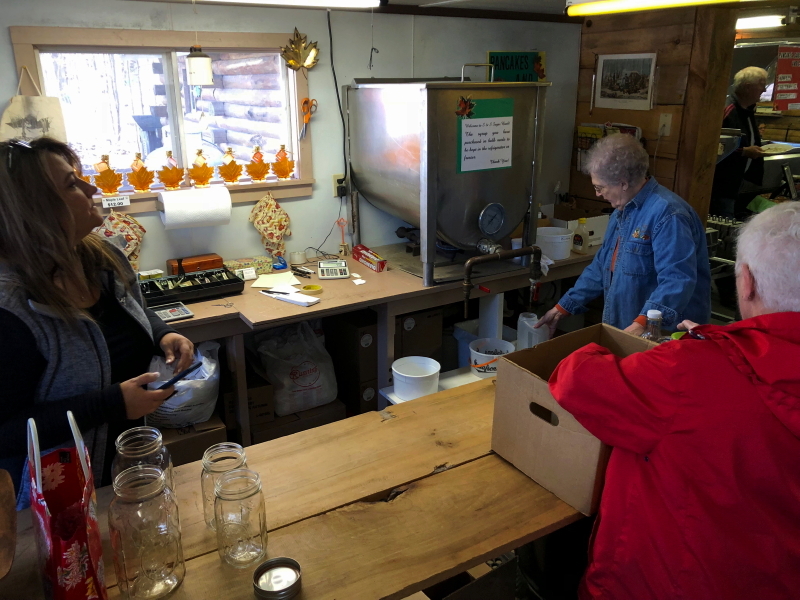 We’ve figured out the routine and bring two 2-quart Mason jars to be placed under the spigot of the large tank and filled with the dark amber bliss every April during the S & S Sugar Bush open house pancake breakfast weekend. It’s hard to find an event pancake breakfast that isn’t pretty darn good, be it firefighters, boy scouts, legions, or service clubs, but I gotta say the fresh, hot blueberry cakes, sausage, and pure maple syrup combination we enjoyed yesterday morning tasted about as good as I can recall ever experiencing. Our friends Mike and Barb Wilkus accompanied us, having also joined us for the live Climate Cast at MPR Thursday night and then sleeping over to be available for the Sugar Bush open house. After the scrumptious breakfast, we took a stroll through the woods to witness the number of tapped trees that were supplying the sweet maple sap. It is impressive to consider the hundreds of gallons of sap running up through the roots of these trees when the spring temperatures are just right —warm during the day and below freezing at night. One of the Stockwell sons described how the percent of sweetness drops in time, but his grandpa would collect the later sap for a vinegar. The syrup open house has become so precious to us, Cyndie invited more friends to stop by today so she could go again and share the event with them, too. I reckon the delicious pancakes might have something to do with her zeal, as well. There is another precious annual event that will be happening next week for us. 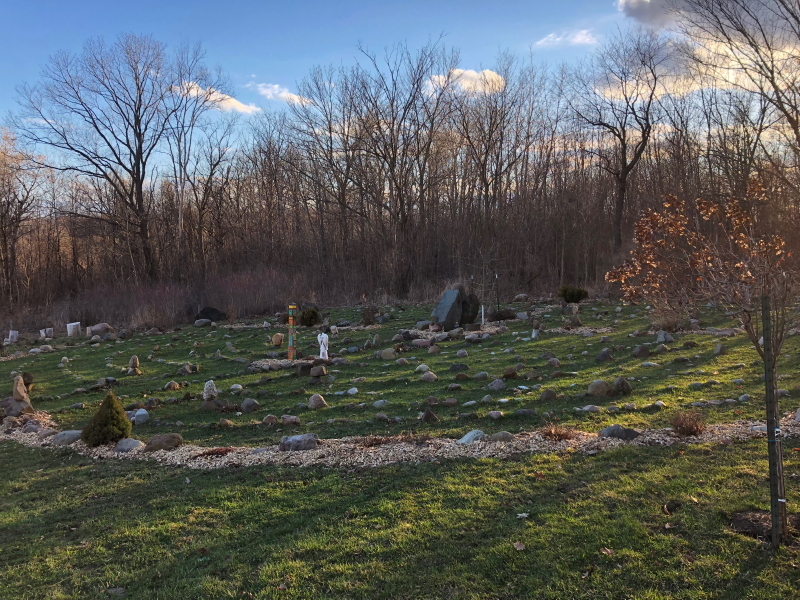 For the second year in a row, Wintervale Ranch will be holding our own open house as a host site for The Labyrinth Society’s World Labyrinth Day Peace Walk. Walk as one at 1. Around the world, at each location, people will walk and visualize peace at 1:00 p.m. in their time zones, creating a wave of peaceful energy flowing around the globe. Cyndie has been working to spruce up our labyrinth, despite the lack of growth from the barely thawed landscape. 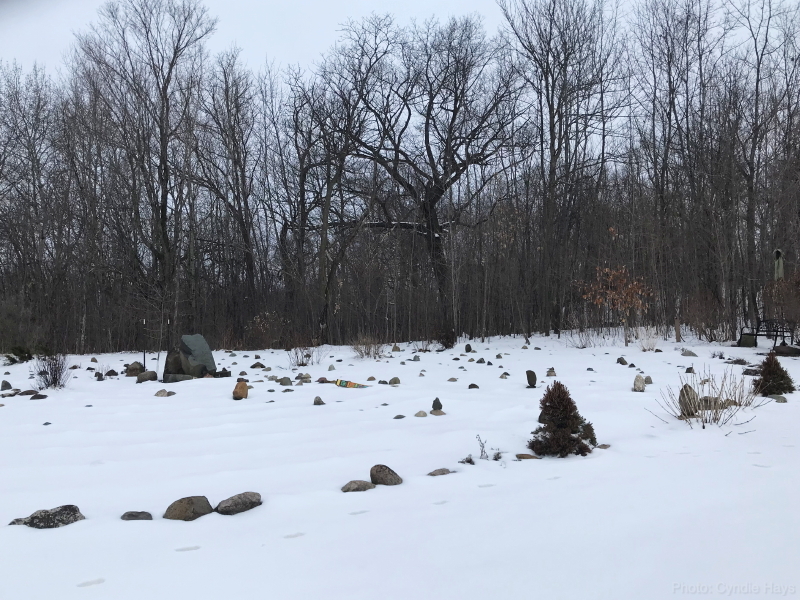 I noticed when Barb and Mike were here and we did a moonlight walk Thursday night that the overnight freezing and daytime warm sunshine was still conspiring to tip over plenty of my rock arrangements. It sounds like we can expect some rain showers this coming week, so maybe new growth will be exploding in spectacular glory for visitors on Saturday. 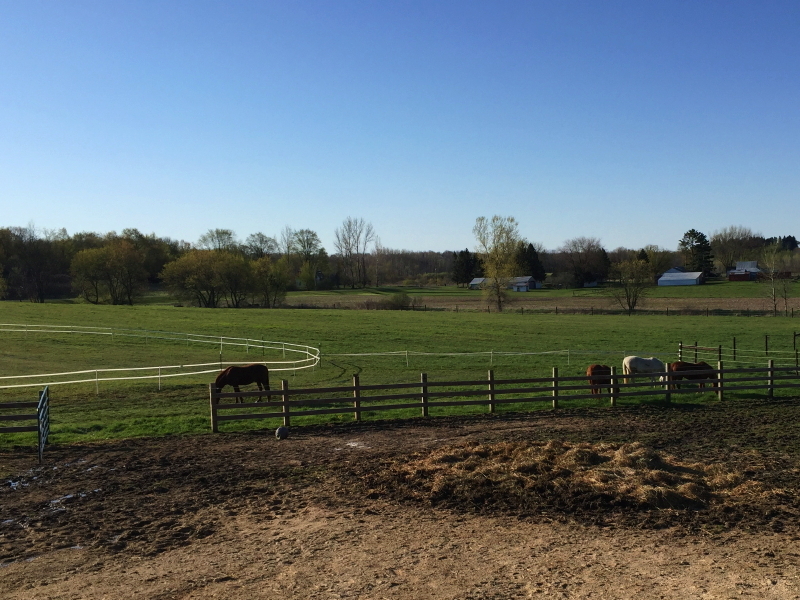 If the day dawns nearly as spectacular as today, World Labyrinth Day will be a wonderful opportunity to experience the best of Wintervale Ranch. If you are reading in the Twin Cities area, I hope you will consider joining us! Saturday, May 5, 2018 between 12:00-3:00 p.m. Please email cyndie@wintervaleranch.com to register and receive directions. 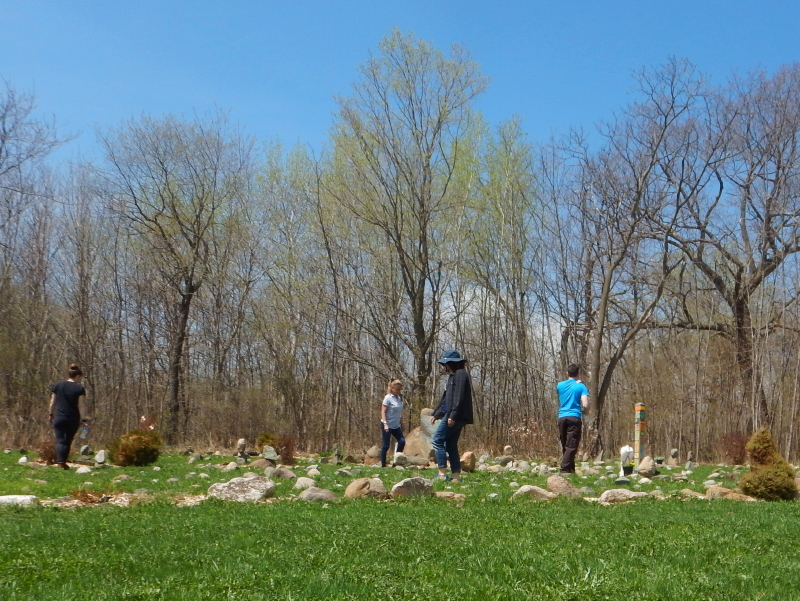 Wintervale Ranch and Retreat Center hosted a World Labyrinth Day event yesterday and participated in the Walk as One at 1:00, a global wave of taking steps for peace. 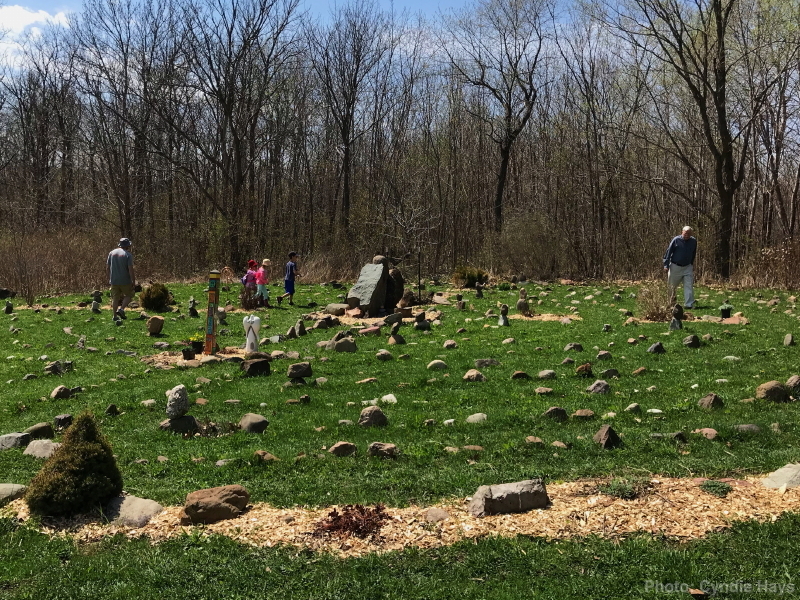 Family, friends, friends of friends, neighbors, and previous property owners arrived throughout the afternoon on a beautiful May day to trek the roundabout path and ponder. One participant mentioned she had spent 35 minutes striding to the center and back out again, adding that stopping to touch things may have lengthened the duration of her journey. 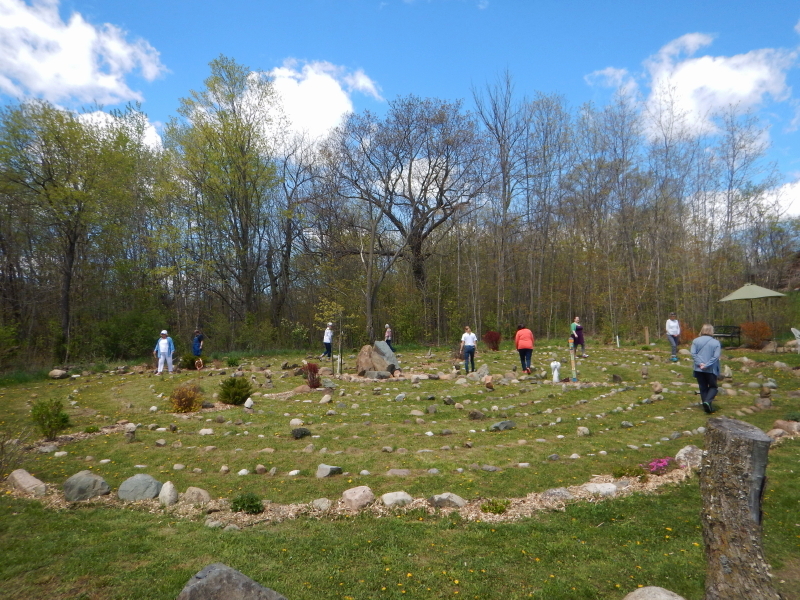 It was a delightful departure from my norm to see the labyrinth energized with so many souls walking together. I spend a lot of solo time in that garden. Cyndie worked her magic in the kitchen to fill the counter with a wide variety of fresh-baked caramel rolls to provide both energy and incentive for walking. I was careful to avoid eating a great big serving, but by sampling bite-size nibbles from the plain, frosted, with raisins, and finally, a pecan covered version throughout the entire day, I’m sure I successfully obliterated the balance of my healthy food pyramid for the week. After the labyrinth, the chickens and their coop became a prominent attraction for visitors, followed by a stop to see how the horses were doing. It was an invigorating day. As always, our belief was confirmed. As fabulous a place to live as this is, it is never in full spectacular bloom until guest arrive to launch the ultimate greatness. Thank you to all of you who found your way here yesterday. It made for a wonderful mix of energized peacefulness. I am very happy to be able to report that Dezirea has made enough progress toward good health that Cyndie decided to allow her back with our other horses. In fact, to celebrate the milestone, Cyndie let all 4 of them step out onto the green grass for their first brief taste of the spring. We have now arrived at the difficult period when we meter out their minutes of grazing on the lush spring growth. In years past, the strict constraints on the time we allowed them were merely applied to ease their digestive systems into the change. Then we came to realize that they don’t work hard enough to justify the rich diet full-time. We have to limit their grazing most of the year in order to keep them from becoming overweight. Cyndie has purchased some muzzles in hope of giving the horses a chance to roam the pasture without over-eating. They can eat through the muzzle, but it takes a bit more time and effort. It will slow down their intake. Since they are not out on the pasture full-time, they’ve been eating hay longer into the warm months. Last night we visited a new local source of small bales that Cyndie found through an ad. We filled the back of the pickup with as much as it would hold and hustled back to the ranch, quickly serving up a few test bites to the horses. They loved it! That was a relief. Hauling hay at the end of the day was a lot of work, because we were already fatigued from continued sprucing of the labyrinth, mowing the lawn, re-hanging the vines across the path out of the back yard, spending time with chickens out of the coop, and turning the composting manure piles. Today will be a much more leisurely day. It’s World Labyrinth Day! We are expecting visitors around noon, so after a few small chores of preparation in the morning, we will be lounging, snacking, visiting, and walking for peace throughout the afternoon. I’m looking forward to having the afternoon off.